Abstract: Top marine predators with long life span, such as tuna can contain high concentrations of organochlorine contaminants (OCs). Tuna is good bioindicator that serves for obtaining the marine ecosystem contamination. Being an important foodstuff, it also presents potential source of human exposure to contamination. Light meat samples of 9 wild bluefin tuna (Thunnus thynnus) caught in Adriatic Sea were freeze-dried, extracted with n-hexane:acetone=50:50 (20 mL) in Microwave Accelerated Reaction System (CEM, USA). Extracts were further cleaned with 96% sulphuric acid, by adsorption chromatography on a multilayer silica column and finally on a commercial tubes pre-packed with carbon. Analysis was done on high-resolution gas chromatograph (Clarus 500, Perkin Elmer) with ECD detectors on two capillary columns simultaneously. The highest concentrations were found for p,p´-DDE which is the main, highly stable p,p´-DDT's metabolite. Concentrations of p,p´-DDT were 2 to 20 times lower than of p,p´-DDE. Sum of six indicator PCB congeners accounted between 54% and 75% of total PCB concentrations. Higher chlorinated indicator PCBs (PCB-153, PCB-138, and PCB-180) were found in the highest concentrations. 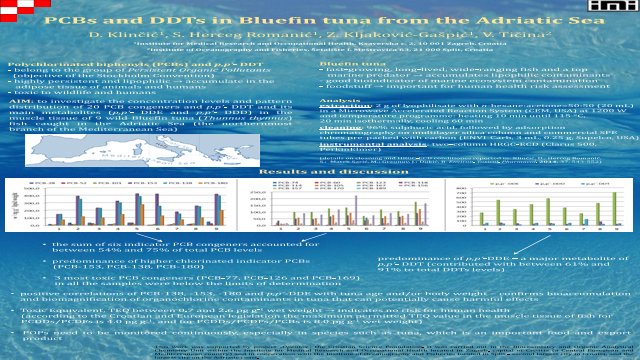 Positive correlations of PCB-138, -153, -180 and p,p´-DDE with tunas age and/or body weight confirms that the most stable and the most resistant to degradation organochlorine compounds accumulate in tuna organism during her life.